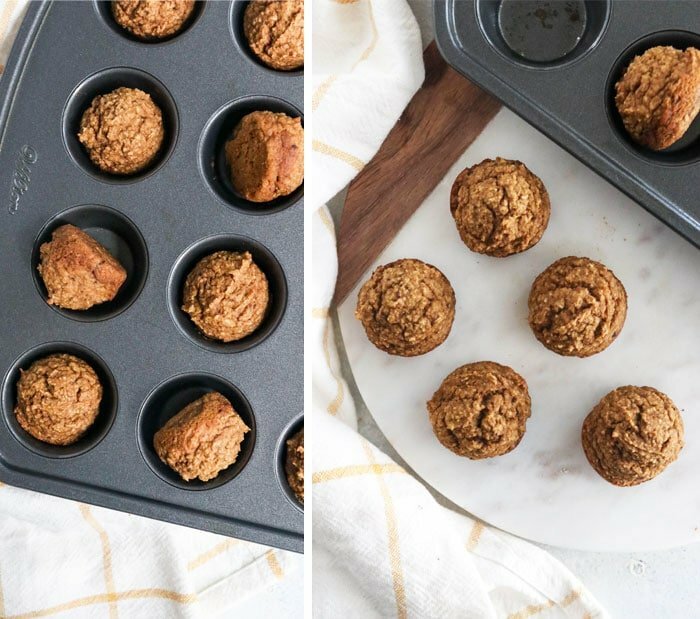 These healthy pumpkin muffins are a delicious Fall treat, made with easy whole food ingredients. I love that they’re naturally sweetened with fruit and don’t require any flour or oil! 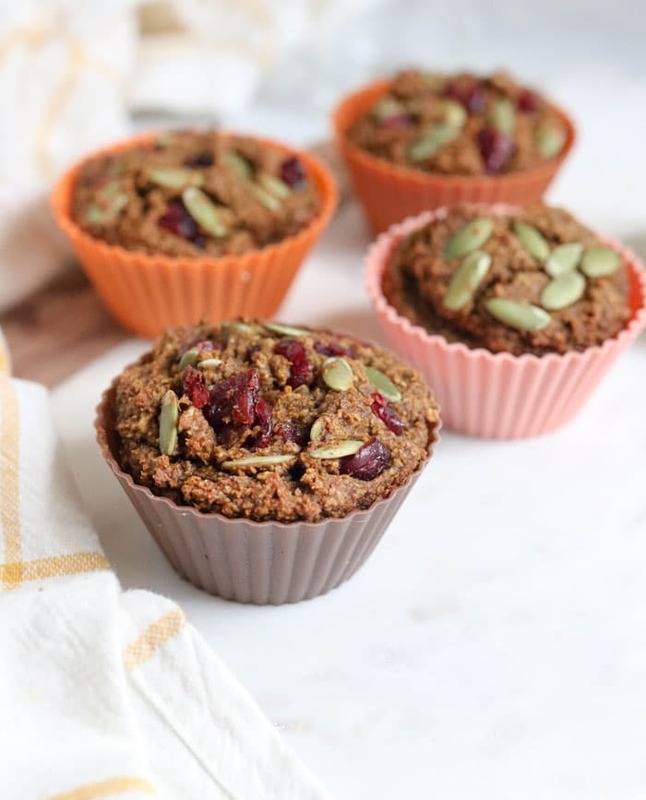 I was inspired to make these muffins because I wanted my son to have something nut-free that he could pack in his school lunchbox. 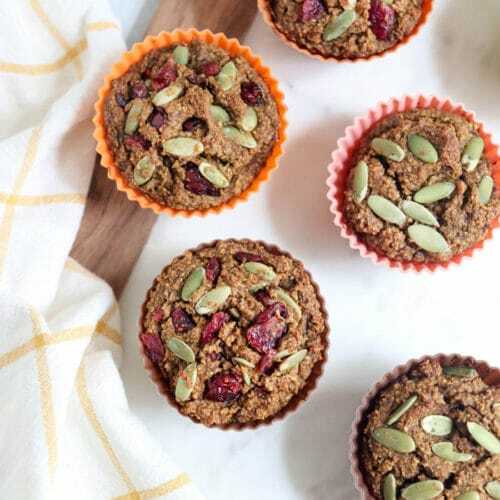 I didn’t want to send him off with something too sugary, so I relied on fruit as the sweetener in these muffins, and blended them together with rolled oats, pumpkin puree, and eggs for filling fiber and protein. As you may know, I’m in love with using dates in my baked goods because I think they are the healthiest sweetener on the planet. You can read more about why I think they are so good for you in my post on how to make date paste. And if you’re worried about the sugar in fruit, I hope you’ll check out my post on why I don’t limit my fruit intake. My 5-year-old is my ultimate “picky eater” right now, so trust that if he thinks these muffins are good… they’re good. Not just good for being a healthy treat, but good because they are delicious. I hope you’ll love them, too! 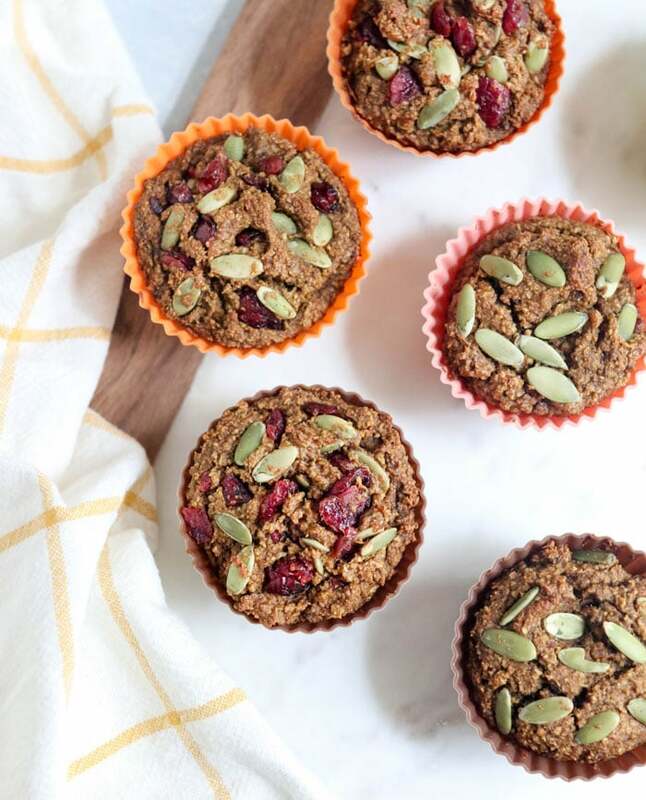 I like to add some pumpkin seeds and dried cranberries into these muffins when serving them to adults, as they add a nice contrast of textures and flavors, but my kids won’t touch them that way, so I usually only sprinkle these additions on top. If you have more adventurous eaters, fold them into the batter– or just leave them out for a simple pumpkin muffin. This recipe makes 7 full-size muffins, or 20 mini muffins. Feel free to double the recipe if you want to fill a standard 12-cup muffin tin. I like to make these in a mini muffin tin for my kids, since they don’t eat huge portions as it is, so I’ve included the baking time for that in the recipe notes below. These healthy pumpkin muffins are naturally gluten-free and nut-free, and make the perfect treat for a school lunch. I love that they are sweetened with fruit, and are made without added flour or oil. Line a muffin tin with 7 muffin cups (I use these silicone liners) and preheat your oven to 350ºF. Place the dates in a large food processor fitted with an S blade, and process them until broken down slightly. It's okay if they form a ball. Use a spatula to break up the dates if they have formed a ball, then add in the pumpkin, water, salt, pumpkin pie spice, vanilla, and egg. Process again until smooth. 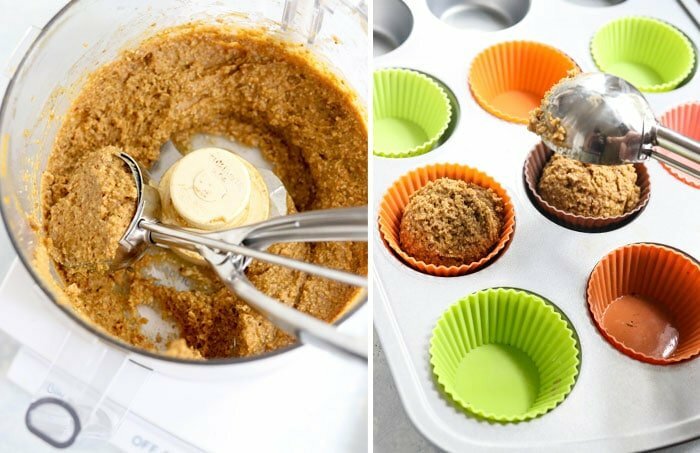 Use a 1/4 cup to scoop the batter into the lined muffin cups. Bake until the muffins have risen and feel firm when you lightly touch them in the center, about 20 to 22 minutes. Let them cool for at least 20 minutes in the pan before serving. Muffins can be stored at room temperature for a couple of days, but for best shelf life I recommend storing them in an airtight container in the fridge for up to one week. Note: I love making these muffins in a mini muffin tin for my kids. This recipe makes about 20 mini muffins, and I bake them at 350ºF for 13 minutes in that case. I haven’t tested a vegan version of this recipe yet, but you might be able to use a flax or chia egg instead of the real egg. Please leave a comment below if you try it! If you don’t have enough dates to make this recipe, you can use some banana in their place, but that will change the flavor a bit. As always, if you experiment, please leave a comment below letting us all know what worked for you! Reader Feedback: Do you have any nut-free recipes to share for school lunches? Please share in the comments below! I have made these muffins dozens of times and love them every time! I only use about 6 dates for the single recipe (though I usually double the recipe and freeze some), less than called for but sweet enough for me. I use a flax egg, which works great and I sometimes swap mashed banana & cinnamon instead of the pumpkin & spice. Either way, two of these for breakfast with a smear of cashew butter and I’m set for hours! Perfect once again . These were So so good my kids gobbled them down 😂😂and maybe mama too😁 thank you !!! I just made your recipe for date paste. How much of the paste would you use in place of 3/4 cup of medjool dates? Thanks! I would probably use 3/4 cup of the date paste for this recipe. Any other squash puree, like butternut, would work or you could try sweet potatoes. I always love having new ideas for a quick breakfast item! Thanks for posting! Love these muffins. I added 1/8 cup cocoa powder instead of pumpkin pie spice and chocolate chips instead of dried fruit. I like the oatmeal muffins better than the Paleo Double Chocolate Pumpkin muffins since almond butter does not always agree with my digestion. I love these! I added frozen raspberries instead of dried cranberries and they came out amazing! I find these they taste even better cold straight from the fridge. Hi I want to try these muffins but I cannot seem to find Pumpkin Puree. I have canned pumpkin, not pie filling, and it can be used for all types of baking. Is this okay to use? Would these work with steel cut oats or rolled oats? I don’t have any quick oats on hand and would love to make these. I used rolled oats and they came out great. I cannot believe your son is 5! I have been following along for that many years?!?! Time flies. P.s. I knew I should have bought pumpkin purée today. I have made them twice in 1 week! They became my breakfast with coffee to go! I baked mini muffins for my toddler and he love them too! I used sweet potatoes instead og pumpkin cos i only had very little pumpkin puree left, so i combined both and taste delicious! Where did you get the spoon to scoop them? Well, you know you have hit the jackpot when kids are stealing muffins off the counter! Thanks, Megan for another yummy recipe. Absolutely wonderful! I topped mine with a pinch of light brown sugar, dried cranberries and seeds and pecans and baked in mini muffin tins. This should be on The Best Thing I Ever Ate!! Thanks for sharing! Aw, thank you! Those toppings sound perfect. Glad you enjoyed them! I have a question about the amount of dates the recipe calls for…6 oz. or 3/4 cup. I used my scale, and 12 oz was about 21 dates (I’m doubling the recipe). If I had used a measuring cup I’m sure I would have used much less for 3/4 cup. What are your thoughts on the amount of dates? Thanks! If you tightly pack the 3/4 cup with the dates the ounces almost always work out to be 6 ounces by weight for me. And in past experience I’ve measured a 1/2 cup to be 4 ounces when it’s a tightly-packed cup, so I would generally guesstimate that each 1/4 cup of tightly packed dates is about 2 ounces. But you don’t have to be super precise about it! I just include the measurements because some people don’t use cups to measure. This recipe is pretty forgiving. If you loosely put them in the measuring cup the recipe will just be slightly less sweet, but still muffin-like! I forgot to say that I used a chia egg and it worked great! My muffins were gummy but I’m pretty sure that’s because I used soaked (and dried) oats and I haven’t really figured how to bake with them yet. I just made these and love them! They were listed under my suggested content on Chrome and I handed over the baby to my husband and made them immediately. 😀 I was hoping to share with my 10-month old, but they were way too sweet for him (I haven’t given him anything sweet yet) so I get them all to myself. 😉 I’ll play with the recipe and see if I can halve the dates but if I can’t get that to work, I’m happy with making them just for me. And I love that there’s no coconut in there! I try not to eat coconut every day but it’s one of the few fats I can have so it’s hard. Thanks for the recipe!